Dosbat: Cryo-Sat 2 and PIOMAS. I recently posted with a link to Neven's Sea Ice Blog, the title of that post was 'PIOMAS Vindicated!' That post, and its title, was written before I had sight of the Laxon 2013 paper "Cryo-Sat 2 estimates of Arctic sea ice thickness and volume". Having now read that paper my opinion hasn't changed. But in a recent email exchange someone has called into question my claim that PIOMAS is vindicated. So I thought I needed to explain my view. Cryo-Sat 2 (CS2) uses a radar altimeter called SIRAL. SIRAL operates using scatter signatures of the surface, in particular looking for scattering differences between water and ice, this requires that the ice be cold and dry, conditions that only apply through autumn and winter. So CS2 only gives data from October to April. Also CS2 needs a full month of orbits to build up sea ice thickness plots, so it produces what in effect are monthly averages. As discussed before on this blog, PIOMAS is a model of the ice and ocean that is driven by atmospheric variables derived from NCEP/NCAR reanalysis. Firstly the seasonal cycle is a key issue for me when deciding whether a model is any good. This is important to me in view of the findings of Wang & Overland, who find that models (GCMs) that reproduce the observed seasonal cycle of sea ice produce earlier sea ice free years. Fig 1, figure 3 of Laxon et al 2013, PIOMAS seasonal cycle (line and circles) compared with CS2 (triangles). As Schweiger et al note, PIOMAS appears to overestimate thin ice and underestimate thick ice. Whilst this might explain PIOMAS being lower than CS2 around volume maximum (underestimating thick ice), it doesn't explain the early rapid ice growth seen in CS2 which is not so rapid in PIOMAS. However the two seasonal cycles are very close. And the October figures (first triangle in each year's series) are closer than November, implying that the September minima are probably quite close. Overall, given the amount of white space available PIOMAS is producing a seasonal cycle that is in reasonable agreement with CS2, i.e. it could have been wildly out. The early autumn growth seen in CS2 is important because this is part of a negative feedback; rapid growth of ice in response to anomalously open water and thinner ice at the end of recent melt seasons. So PIOMAS may be underestimating the rapid gain in volume early in the melt season. This is not a surprise, the process at play of heat loss is so strong that any small error in PIOMAS's reproduction of this could have large impact on the volume change. 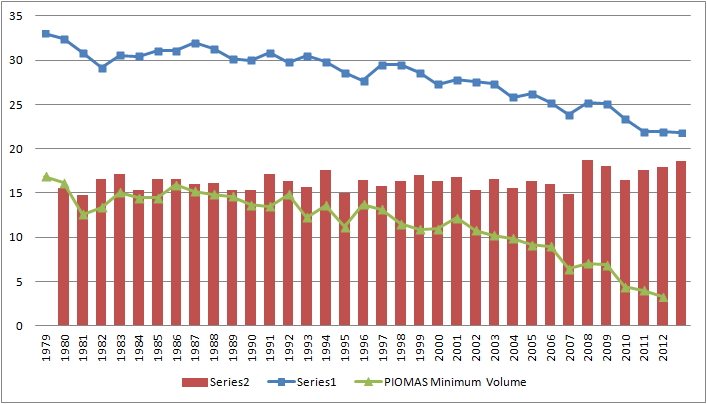 However despite this PIOMAS is producing less volume loss since the ICESat period. Table 1 of Laxon et al shows that the PIOMAS volume loss between the average for 2003 - 2008 and the average for 2011 - 2012 is -2644km^3 in Oct/Nov and -2091 for Feb/Mar. These figures are massively below those for the loss adjusted for sea ice concentration (adjusted) and the loss when not adjusted for concentration (unadjusted). This can be appreciated from the figures for table 1 reproduced below. The adjusted data is more comparable with the PIOMAS data, the unadjusted more comparable with ICESat, these two systems respectively use/did not use adjustment. Table 1, table 1 of Laxon et al. Arctic sea ice volume (km^3), 2003 to 2008 is the ICESat period, after 2010 is CS2. 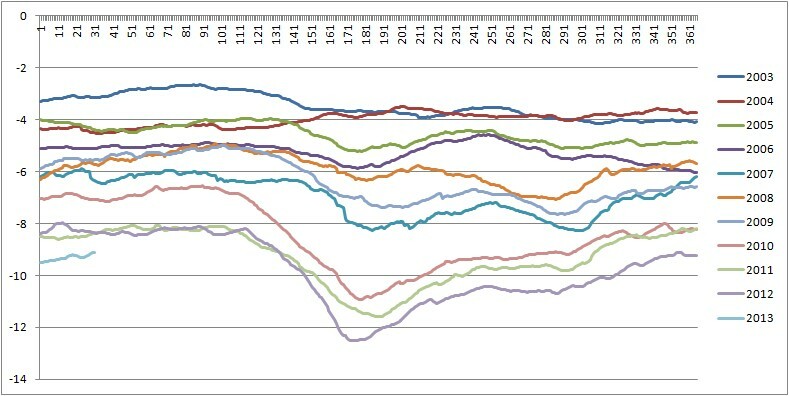 Fig 2, PIOMAS annual range (red), minimum (green) and maximum (blue) volume. 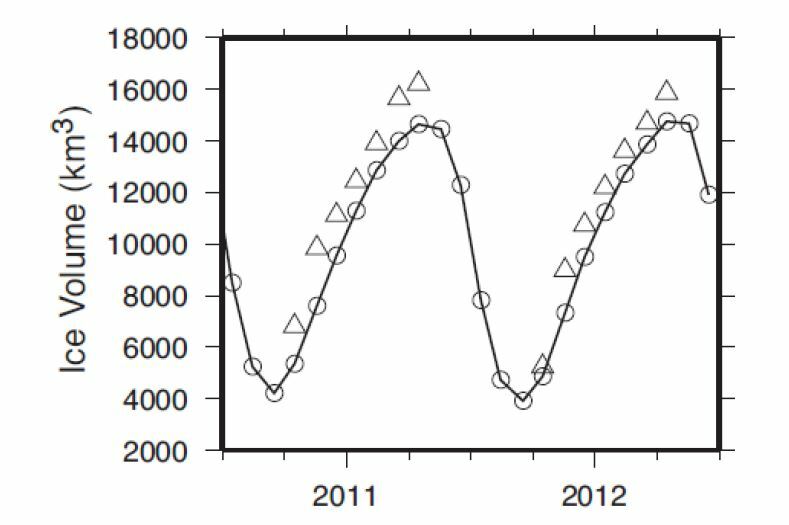 The issue at hand is whether the satellite data support the basic PIOMAS message that volume in the summer is collapsing to the degree that since 2006 around half the volume at minimum has gone. It is this that implies that the GCMs are getting it badly wrong and that we probably face a very short time until we see a virtually or completely sea ice free Arctic. Qualitatively this is now supported by a combination of ICESat and CS2 data. It is now harder to make the case that volume is not in a massive decline, and this has implications for area/extent which in turn increases the ice albedo feedback with respect to open ocean. 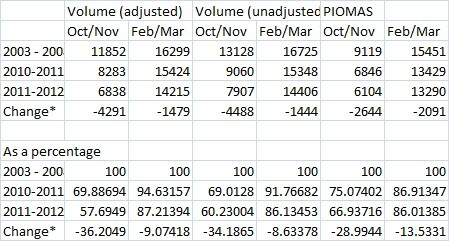 But is PIOMAS right about other matters, mainly the change of seasonal cycle of volume since 2010? Regular readers will know I keep banging on about the 2010 event, what caused it, and why it was important. There is too little data in the Laxon paper to address this, CS2 doesn't span 2010, and doesn't give figures in the spring, when the anomalously large melt is taking place in PIOMAS. Fig 3, adapted figure 2 of Laxon et al, comparison of the sea ice thickness profiles in the Arctic ocean for ICESat, Cryosat 2, and PIOMAS. This has been adapted by labelling the months for the columns and labelling the systems and year periods involved. However what can be said with the new data is that sometime between 2008 and 2010 something caused a substantial loss of thick ice off the Canadian Arctic Archipelago. So far only PIOMAS suggests that this was largely due to a discrete event in 2010, so far only PIOMAS suggests the massive losses of volume in spring of the years following this event. Finally we can speculate that the lower ice thickness and volume in February/March 2012, as compared with February/March 2011, may have been one factor behind the record minimum ice extent reached in September 2012. In view of the current situation, it will be interesting to see February/March CS2 plots for 2013. In memory of Dr Seymour Laxon, and humble appreciation of his work. Laxon et al, 2013, "CryoSat-2 estimates of Arctic sea ice thickness and volume." PDF. With thanks to Phil Chapman. Schwieger et al, 2011, "Uncertainty in modelled sea ice volume." PDF. Wang & Overland, 2009, "A sea ice free summer Arctic within 30 years? ", HTML. Thanks for the detailed analysis, Chris.